Neighborhoods with insufficient access to healthy, fresh food, often face multiple challenges including a lack of public spaces for communities to gather, as well as low-risk, relatively inexpensive start-up business opportunities. 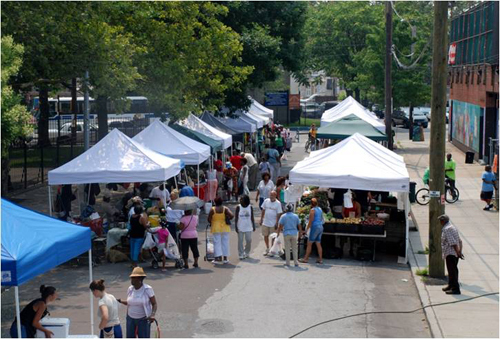 Through a lighter, quicker, cheaper (LQC) approach, public markets bring healthy food into disadvantaged communities, activate space, and become vibrant, safe community gathering places, providing economic opportunity to local residents. East New York Farms! (ENYF!) in Brooklyn, NY, belies a commonly-held perception that public markets in low-income neighborhoods don’t work. Since its inception in 1998, ENYF!, where over 45% of customers participate in a federal nutrition assistance program, has established and managed two farmers markets, two urban farms, and a community youth internship program. Watch our video below to see ENYF! in action.